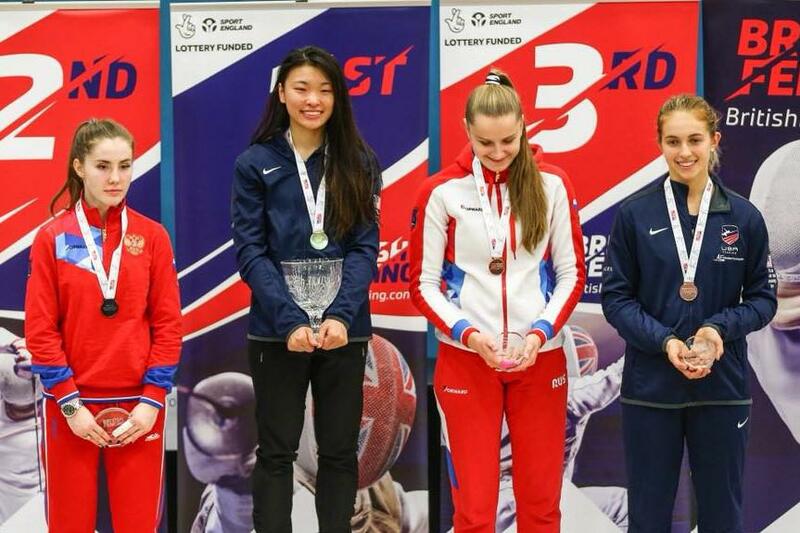 (Colorado Springs, Colo.) – Team USA’s May Tieu (Belle Mead, N.J.) and Sylvie Binder (Armonk, N.Y.) led the U.S. squad to its best result at a women’s foil Junior World Cup since 2010 on Saturday, winning gold and bronze in London. In the men’s event, Marcello Olivares (Cooper City, Fla.) and Ashton Daniel (Cupertino, Calif.) each earned top-eight finishes as well. A bronze medalist at the Youth Olympic Games last month, 17-year-old Tieu earned a bye into the table of 64 where she defeated 16-year-old Sara Martos (El Cerrito, Calif.), 15-7. Tieu won her next bout against Polina Kozaeva (RUS), 15-4 to advance to the table of 16 where she won by a touch at 12-11 against Leonie Ebert (GER) – a 2015 Cadet World Champion who is now ranked No. 8 in the world as a senior. Tieu fenced another U.S. teammate in the quarter-finals as she earned a 9-7 win in three periodsd against 16-year-old Weintraub who claimed her first individual top-eight result on the Junior World Cup circuit. Binder defeated Renata Tomczak (POL), 12-7, in the table of 64 and Aude De Brem (FRA), 15-8, in the 32. In the 16, Binder nearly shut out Irene Petrova (RUS), posting a 15-1 victory in the first of three straight bouts against Russian opponents. Binder secured her second career individual Junior World Cup medal with a 15-12 win over Alexandra Sunduchkova (RUS). Scruggs, a 15-year-old individual bronze medalist at the 2018 Junior Worlds, earned her first top-eight result at a Junior World Cup in London where she took four straight DE victories before falling to Anna Udovichenko (RUS), 14-10, in the quarters. Eighteen-year-old Zhou also earned her first top-eight on the circuit. After four DE wins, Zhou faced a third Russian in the quarter-final lineup in Vitalina Anaschenkova, but fell short of the podium with a 15-8 loss. In the semifinals, Anaschenkova held a 10-6 lead in the second before Tieu came back to tie the bout at 11 and closed with three straight hits for a 15-13 victory. Binder fenced Udovichenko in the other semi, holding the score within one in the first period and ending the second with a tie at four. In the third, Udovichenko pulled away with an 11-2 run to end the bout at 15-6 at the end of the third period. With her first individual Junior World Cup medal guaranteed to be silver or gold, Tieu took on Udovichenko in the finals, taking a 5-1 lead at the end of the first period and scoring six unanswered touches to win the bout, 15-5, in the second. Binder and Tieu remain No. 2 and 4 in the Junior National Rolling Point Standings with 17-year-old DeVore as No. 1 and Scruggs as No. 3. Zhou remains No. 5 while Weintraub moved up from No. 7 to No. 6. Scruggs and Weintraub also earned points in Cadet National Rolling Point Standings where they remain No. 1 and No. 2, respectively. In the men’s event, 17-year-olds Olivares and Daniel placed seventh and eighth, respectively. Both fencers won their first four direct elimination bouts, but Olivares lost in the quarters to 2016 Cadet World bronze medalist Luis Klein (GER), 15-6, and Daniel dropped his about against 2017 Cadet World Champion Kirill Borodachev (RUS), 15-9. Olivares, a silver medalist at the 2018 Cadet Worlds, moved up to a position as the No. 4-ranked U.S. fencer in the Junior National Rolling Point Standings as he aims to qualify for his first Junior World Team. Geoffrey Tourette (Cupertino, Calif.), a 2017 Junior World Team Champion who finished ninth in London, remains No. 1 in the junior standings. Nick Itkin (Los Angeles, Calif.), the reigning individual Junior World Champion, was eliminated in the 32 in London and holds the No. 2 position in the standings. Kenji Bravo (San Francisco, Calif.), the reigning Cadet World Champion and Youth Olympic silver medalist, also finished in the top 32 and is ranked as the No. 3 U.S. fencer in the nation. Daniel’s top-eight result allowed him to climb from No. 15 to No. 10 in the standings.